It has been proven that the Stonehenge in England and Newgrange in Ireland have their primary axes carefully aligned on a line of sight pointing to winter solstice Sunset and Sunrise respectively. These monuments were sites of worship and celebration. In Northern Europe, a 12-day winter solstice is celebrated in form of a festival called ‘Yule’. Many modern day Christmas traditions and practices are inherited from this festival. Traditionally, the Winter Solstice in European region is celebrated on 25th December. In Asia, it is celebrated few weeks later, on 13th/14th January. This period is also the period of harvest and of utmost importance for all cultures, that depend on agriculture. The Julian calendar starts from 14th January and the Russian Orthodox church still celebrates it as the Old New Year. This Julian new year, aka Orthodox new year is also celebrated in many European & African countries including Serbia, Kosovo, Bosnia, Belarus, Uzbekistan, Georgia, Azerbaijan, Kazakhstan, Montenegro, Moldova, Ukraine, Wales, Switzerland, Scotland, Herzegovina, Morocco, Libya and Montenegro. In many regions, it is also known as Little Christmas. Traditions in some of these countries are similar to how we celebrate in South Asia, especially the Bonfire. Now let’s talk about South Asia. Being primarily into Agriculture, this festival of Harvest is one of the most important festivals in region. Hindu Tradition celebrates this date as Makar Sankranti. The Punjab region calls it Maghi. Instead of celebrating it on exact date of Winter Solstice, festival is observed on the last day of month, in which Winter Solstice occurs. Technically, this celebration is the passing of winter solstice and harvest. Maghi or Makar Sankranti is also seen as the start of new financial year. The new year’s eve is celebrated as Lohri in North India. If we look at the geographic position of North India, 13th January is the day every year, after which sunrise starts to happen earlier every morning until June, when this cycle reverses. Global Economy used to rely on Barter System for ages. My mother tells me that her grandfather used to repair tools and equipment used by farmers. For most of the repairs, he was not paid. But during harvest, every farmer in village would come to gift a share of their crop. There were special store rooms and silos, where this harvest was kept. The extra stuff was sold to get money for rest of the year and silos were always full for food till next harvest season. In such happy times, it was obvious that many traditions were born. For example, before Lohri, children would go from door to door asking for treats. Kite flying, participating in fairs and dance is the most common of all. Since the Lohri night would be the longest night of year, everyone would gather around a bonfire and spend time singing, dancing, celebrating and hoping for better time ahead. As we know, men used to work in farms. A boy born in any house that year becomes more important for families, as he would grow up to support in Agriculture. Lohri slowly became a festival, where families would celebrate the birth of a boy. The tradition still continues. Sunder mundriye ho! Tera kaun vicharaa ho! Dullah Bhatti walla ho! Dullhe ne dhee vyayae ho! Ser shakkar payee ho! Kudi da laal pattaka ho! Kudi da saalu paata ho! Salu kaun samete ho! Chacha gaali dese ho! Chache choori kutti ho! zamidara lutti ho! Zamindaar sudhaye ho! Ke Gin Gin bhole aaye ho! Ek bhola reh gaya! Sipahee far ke lai gaya! Sipahee ne mari itt! Bhaanvey ro te bhaanvey pitt! Sanoo de de Lohri, te teri jeeve jodi! This festival of harvest is known with different names in different parts of the country. From Pongal to Bihu and from Bhogi to Lal Loi, the celebration of winter solstice has its own charm and different folklores to tell. The stories shall remain alive in our hearts, as long as we continue to embrace our past. American Uncle Sam is famous across globe. India had her own Uncle Sam, who came from a Parsi family and was once the most powerful man in country. He was popularly known as Sam Bahadur and made India proud at many fronts. This article is about Padma Vibhushan Field Marshal Sam Hormusji Framji Jamshedji Manekshaw, the commander in chief of Indian Army. Born on 3rd April, 1914 to Captain Dr. Hormusji Manekshaw and Hilla in Amritsar, Sam was 5th of 6 children. He completed his education from Amritsar and from Nainital and joined Sherwood College. Wanting to become a gynaecologist, he requested his father to send him to London. But his father refused. He was unhappy with this and in those days, Field Marshal Sir Philip Chetwode was in process of setting up the Indian Military Academy. As an act of rebellion, Sam became part of IMA’s first intake against his father’s will. During his IMA days, he appeared to be the most witty and notorious cadet. He had many firsts credited to his name like the first Gentleman Cadet (GC) to be awarded an extra drill and first GC to ask for a weekend leave. He was one of the first 22 cadets to graduate from IMA and commissioned as Second Lieutenants on 1st February 1935. Along with him, Muhammed Musa and Smith Dun also graduated, who later became the Army chiefs of Pakistan and Burma respectively, while Sam Bahadur took over as 8th Army Chief of India. General Manekshaw also became the first Indian Field Marshal. 2. Speaking of Indian Army’s Gurkha Regiment (which he joined after passing out IMA), Sam said: “If anyone tells you he is never afraid, he is a liar or he is a Gurkha”. 8. He said “Pakistan would have won the 1971 war” when some reported asked him, what if he would have joined Pakistan along with the regiment he was serving in 1947. 12. General Sam wanted to ensure that Indian Army never indulges in the brutal trends of victorious armies to spoil and dishonour the women of defeated land. So he instructed his men during 1971 war that “When you see a begum, keep your hands in pocket and think of Sam.” As a result, there was not even a single case of robbing/dishonouring by Indian Army. 13. When some ministers in a meeting objected that Sam always address Indira Gandhi as Prime Minister and not as ‘madam’, he reminded them that the title ‘madam’ is reserved for the head lady of a brothel. Although Sam was one of the most powerful, brave and jolly general we had, his style of speaking to politicians made some of our leaders uncomfortable. As a result, he was denied all the post-retirement privileges and was not even given due salary. It was only after President A.P.J. Abdul Kalam met him and ensured that his arrears of 30 years are cleared and he was then presented a cheque of Rs. 1.3 crore. On June 27, 2008, at the age of 94, Field Marshall Sam Manekshaw passed away in Military Hospital in Wellington (Tamil Nadu) due to complications from Pneumonia. He was put to rest in Parsi cemetery in Ooty, but his funeral was not attended by any politician or even military top brass. The future of Princely States would be decided after the date of final transfer is decided. abolition of the use of the title “Emperor of India” by the British monarch (this was subsequently executed by King George VI by royal proclamation on 22 June 1948). The Act also made provision for the division of joint property, etc. between the two new countries, including in particular the division of the armed force. Following this act, Cyril John Radcliffe, 1st Viscount Radcliffe, a British Law Lord was sent to India on 8th July 1947. He was given just 5 weeks cut India into two parts, based on religion. Two separate boundary commissions were setup, one for Punjab and one for Bengal. Both were chaired by Radcliffe. The Punjab Boundary Commission consisted of Justices Mehr Chand Mahajan, Teja Singh, Din Mohammed and Muhammad Munir. The Bengal Boundary Commission consisted of Justices C. C. Biswas, B. K. Mukherjee, Abu Saleh Mohamed Akram and S. A. Rahman. 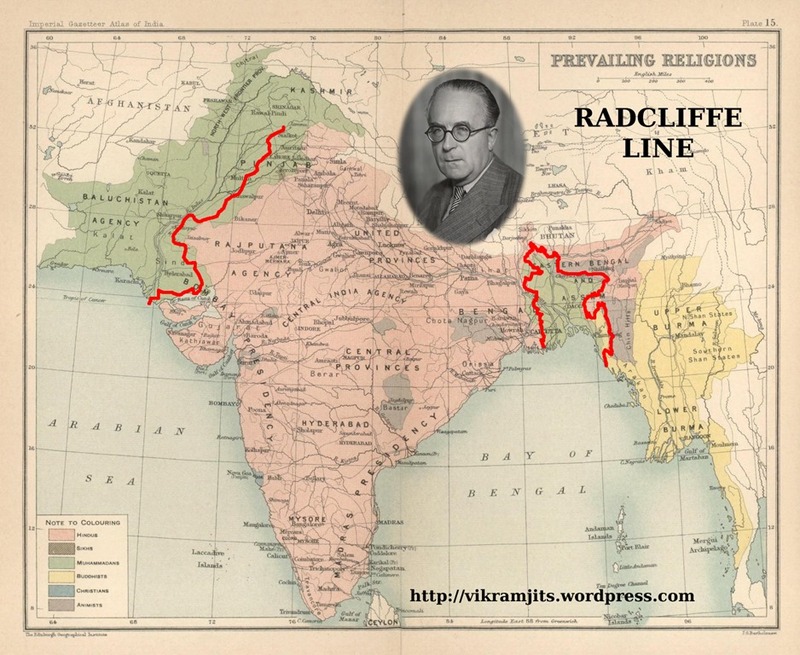 He started drawing the bloody line, which is popularly known as the Radcliffe Line. It divided India between the modern day India and the Pakistan (which later split into East and West Pakistan). Hindus, Sikhs and Muslims were kept in the border commissions, but their internal fight made the decision tougher. Worse, the family (wife & 2 children) of Sikh Judge was killed a few weeks earlier. Britain was in ‘war debt’ and could not afford arranging for adequate resources. Punjab Border Commission was to draw a line right through homeland of Sikhs and Bengal Border Commission was to draw line through Chittagong, home to Buddhists in order to divide India between Hindus and Muslims. Buddhist tribes in Chittagong Hill Tracts had no official representation and were left without any information to prepare for their situation during partition. Line could be drawn only through the British controlled areas, leaving as many as 562 princely states to the hands of their rulers to decide, which side to join. States like Kashmir and Junagadh had ruler from different religion than their majority population, which ended up in major conflicts. Major states like Hyderabad, Jodhpur, Rewa, Gwalior, Jaisalmer, Bahawalpur comprised most of the Indian land and were forced to choose one side. Hindu majority areas like Khulna and Buddhist majority Chittagong Hills were given to Pakistan while Muslim majority Murshidabad and Malda fell in India. Similarly, major Sikh settlements of Lahore, Rawalpindi & Multan went to Pakistan while Muslims rich Gurdaspur, Jalandhar and Ludhiana were given to India. Sindh, from where the name “Hind”, “Hindi” and “Hindustan” is derived, was given to Pakistan leaving as many as 1.4 million Hindus in a stiff. Half of them fled to India. Several important factors were ignored by Radcliffe, which was complained by every party in India. Partition was declared on 17th August 1947, two days after Independence. Many villages hoisted flag of different countries for 2 days, until the confusion was cleared on 17th. For example, Malda was taken by East Pakistan Administration and Pakistani flag was hoisted, until Indian Administration reached after 4 days with correct documents and replaced the flag. Since Partition was declared after the British handed over control, the responsibility of Law & Order during Migration was left to the hands of newly formed governments, who were still taking account of their security strengths and weaknesses. It took them several months to get law enforcement agencies in place, during which, the mass massacre happened. Only 50,000 security personnel were deployed in Punjab, to protect 14 million migrating individuals. There was less than 1 soldier per square mile. India had population of 390 Million during partition, out of which 30 million were to fall in East Pakistan and 30 million in West Pakistan. Approximately 80,000 women were abducted during movement. Less than 30,000 were recovered by 1954. Much more were raped and killed. Several minor battles were fought to annex the princely states and the regions under control of Portugal. Operations of Hyderabad, Goa, Dadar & Nagar Haveli and Sikkim are prominent. The Hindu ruler of the state of Jammy and Kashmir decided to not to choose any side. However, soon after the partition, the tribal forces from Pakistan invaded Kashmir. Maharaja of Kashmir requested India of protection, at which Lord Mountbatten asked him to sign the Instrument of Accession before any help can be provided. Half heartedly, Raja Hari Singh signed the instrument and Jammu-Kashmir officially became part of India. Soon Indian Forces reached Kashmir to help Kashmiris from invading tribal forces. However, a major portion was already taken and instead of massive bloodshed, Nehru chose UN’s intervention for the peaceful resolution. The matter is still a major reason for conflict between the two countries and is considered as the ground for various wars and cross border terrorism. Thousands of years ago, when the earliest known human civilizations decided to explore far far away lands, the concept of migration started. One such migration forms the famous archaeological finding called the ‘Cemetery H Culture’, which spreads from Harappa in Pakistan to the Ganga-Yamuna Basin in India, covering entire East-West Punjab (circa 1700 BCE). This is also considered to be the nucleus od Vedic Civilization. As we all know, this Indus Valley Civilization revolved around trading. They established common paths to move between various settlements, which are used till date. In around 3rd century BC, as the Mauryan Empire was flourishing, a road was built to the main centre of learning ‘Taxila’ and later even further up to Balkh in Khurasan (now in Afghanistan) from Patiliputra (now Patna). This road was used by every traveller who had to cross Khyber Pass and enter into the Hind. The same route was used by invaders like Ghori and Ghazni. With time, the road reached the eastern end of empire, which today falls deep inside Bangladesh. A Greek observer recorded that Samrat Chandragupta Maurya poured manpower to maintain this road. This road is mentioned in several ancient texts and appears as “Uttarpath” (Northern-Road). Time passed and rulers came and went, ruling over the entire breadth of Hindostan, which stretched from present day Afghanistan to eastern ends of Bangladesh. In 16th century, as Emperor Babur came to India, he hired Farid Khan (aka Sher Khan) an Afghan born in Sasram (Bihar), who later dethroned Babur’s son Humayun and took over the throne of Delhi, and became Emperor of Hindostan. This general, popularly known as Sher Shah Suri decided to restore this ancient path and make it more useful. He deployed enormous labour to revive the Uttarpath and connected his hometown Sasaram to Agra. He died soon after that, the Mughals that came afterwards connected Kabul (Afghanistan) with Chittagong (Bangladesh) using this road. Today, this road connects the capitals of 4 countries and covers a total distance of 2500 kilometres (1600 miles). During this time, this road was known by many names, eg: Shah Rah-e-Azam (“Great Road”) or Sadak-e-Azam or Badshahi Sadak. In 18th century, as the British came, they maintained this road and later converted it to a motorable road. They started calling it the “Grand Trunk Road”, sometimes also referring to it as the “Long Walk”. During that period, it was maintained between Howrah and Peshawar. 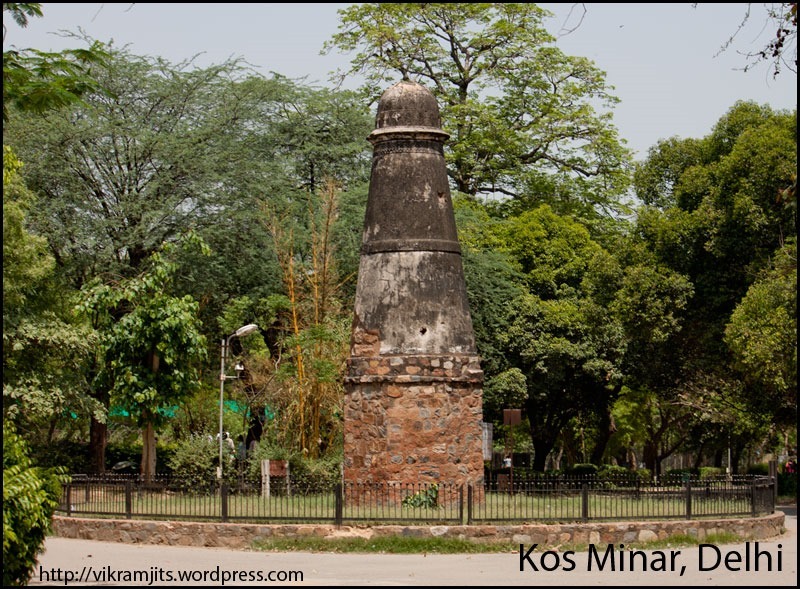 It is very interesting to see how the Afghans & Mughals built ‘Kos Minars’ at each ‘Kos’ (ancient measuring unit with 1 Kos approximately equal to 1.8 Km). They also built forts and most important, Caravan Serais (Inns) at regular distances. These Serais had a mosque, rooms for travellers, area reserved for animals and lot more to offer to travellers than they can ask for while travelling for thousands of kilometres. Many of these Serais are lost, but most of them still exist. Today, huge urban settlements have come up around those historic serais and the only way to identify is to check the name of locality, as most of them still use the old serai names.